The freedoms of expression, assembly and association continue to be violated in Uganda. Addressing Civic Space Restrictions in Uganda: What Role for the UPR? In January 2016, the president signed the Non-Governmental Organisations Act into law. In January 2016, the president signed the Non-Governmental Organisations Act into law.Although the final version of the Act does not contain many of the problematic provisions of the draft bill, the legislation still places limits on the independence of organisations and the freedom of association. For instance, the act bars organisations from doing anything that would be deemed as prejudicial to the ‘security of Uganda’ and the ‘interests of Uganda and the dignity of Ugandans’.Some organisations have argued that the inclusion of the vague term ‘dignity’ is aimed at targeting and limiting the work of LGBTI organisations in Uganda that have faced significant challenges in recent years. Organisations and human rights defenders are subject to intimidation and face physical attacks, threats and harassment by state and non-state actors. On several occasions, the premises of human rights organisations have been the targets of suspicious robberies, during which computers and other documents have been stolen. Although a constitutionally protected right, the authorities have violently supressed peaceful demonstrations and police have routinely arrested protesters, especially in the months leading up to the 2016 presidential election. Although a constitutionally protected right, the authorities have violently supressed peaceful demonstrations and police have routinely arrested protesters, especially in the months leading up to the 2016 presidential election. The Public Order Management Law (POMA), passed in 2013, contains unjustifiable restrictions on the right to assemble peacefully. For example, the legislation grants the police discretionary powers to prohibit public meetings if they are not deemed to be in the ‘public interest’. Under that mandate, the police have disrupted many public assemblies organised by opposition political parties and student movements, arresting the organisers in the process. POMA also gives enforcement agencies power to use broad force to disperse assemblies. 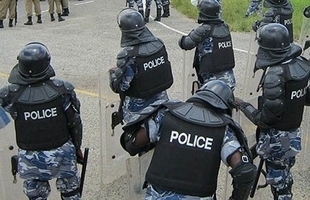 On 15 February 2016, police used excessive force to disperse protesters who were calling for the release of opposition candidate Kizza Besigye. As a result, one person was killed and several others were wounded. Uganda has one of the more vibrant media environments in the region; however, in practice the government restricts the exercise of the right to free expression, using intimidation and attacks against independent journalists and tactics that close spaces for a plural and diverse media. Uganda has one of the more vibrant media environments in the region; however, in practice the government restricts the exercise of the right to free expression, using intimidation and attacks against independent journalists and tactics that close spaces for a plural and diverse media. The space for journalists to practise unhindered became even more restricted in the run-up to and during elections. For example, the government closed radio stations that granted airtime to opposition candidates, and arrested radio journalist Richard Mungu Jakican while he was conducting an interview regarding the presidential elections. Moreover, on election day, the government ordered the telecommunication providers to shut down all social media platforms due to ‘security concerns’. Criminal defamation legislation is still in place and used to silence critical voices. Although there is an access to information law in Uganda, the Official Secrets Act of 1964 has not been repealed and can be used to limit access to information. Government has also ordered media to dedicate one hour of broadcasting per week to government programmes.